Got a waffle iron and a taste for something sweet? If so, these waffles could be in your mouth in just about 20 minutes. 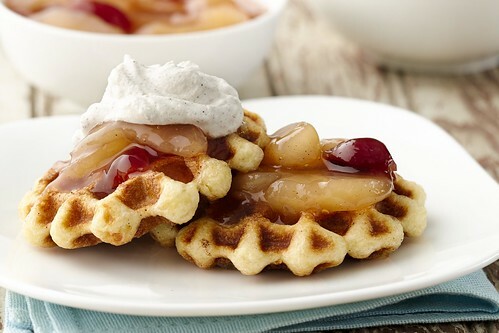 They beautifully marry French toast flavors with waffle-y texture, and the apple cherry topping doesn't hurt anything. It was dreamed up by Tiffany Aaron of Quitman, Arkansas, who will be at the Bake-Off next month. In 1 1/2-quart saucepan, mix apple pie filling and cherry preserves. Cook over low heat until warm, stirring frequently. Remove from heat; keep warm. In shallow dish, beat eggs, 1 teaspoon of the cinnamon and 1 tablespoon of the whipping cream with wire whisk until foamy. Separate dough into 8 rounds. Dip each round in egg mixture, coating well. Place 2 to 4 rounds in waffle maker; close lid. Cook 3 to 4 minutes or until crisp and golden brown. Repeat with remaining rounds.